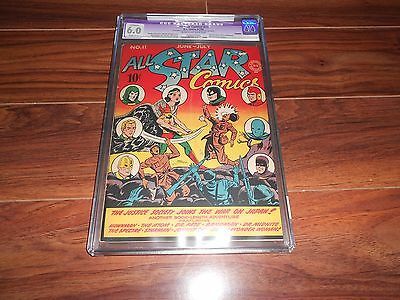 ALL STAR COMICS #11 (6-7/42) CGC APPARENT 6.0 SLIGHT (C-1) RESTORATION INCLUDES: PIECE RE-ATTACHED AND (RIGHT EDGE TRIMMED) CREAM TO OFF-WHITE PAGES. SPECTRE CAMEO. SHIERA APPEARANCE. WONDER WOMAN BEGINS.